View this fascinating introduction featuring historians Bernadette A. Meyler and David Pietrusza on the 1916 Presidential Election and Mr. Charles Evans Hughes of New York, the brilliant statesman, Supreme Court justice, and, under Harding and Coolidge, superb Secretary of State. He would return to judicial work, first on the World Court at Coolidge’s nomination, but also go back to the Supreme Court as Chief Justice, becoming one of President Roosevelt’s foremost adversaries in the implementation of the New Deal. Mr. Hughes’ excellent mind and genuinely impeccable character sets him apart from so much of the “run-of-mill” politics not only in his era but even in ours, one hundred years later. 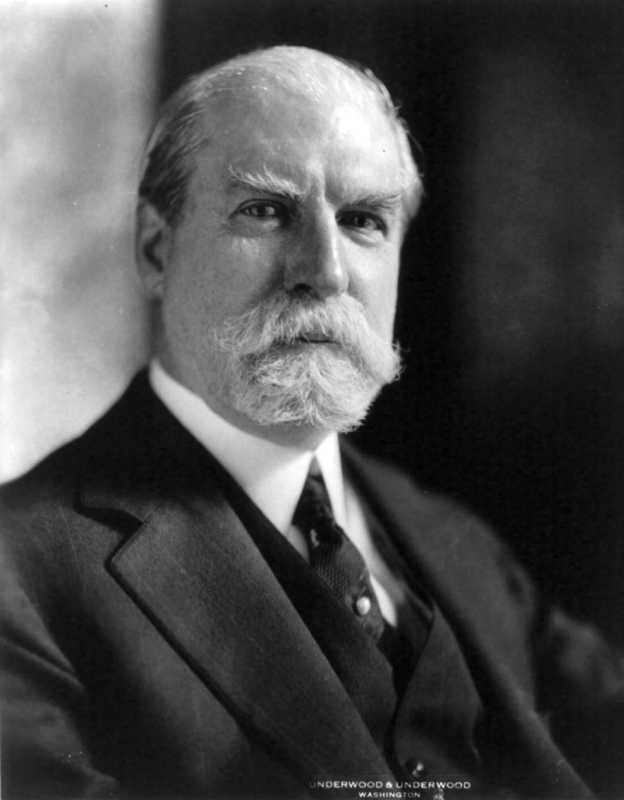 The more one learns about Charles Evans Hughes, the higher his reputation rises. Both he and Coolidge would tragically lose a child and perhaps, as a consequence, held a particular sympathy for one another as bereaved fathers only can. Hughes, just as his name was being reconsidered for the 1920 Presidential nomination, lost his eldest daughter, Helen, to tuberculosis. 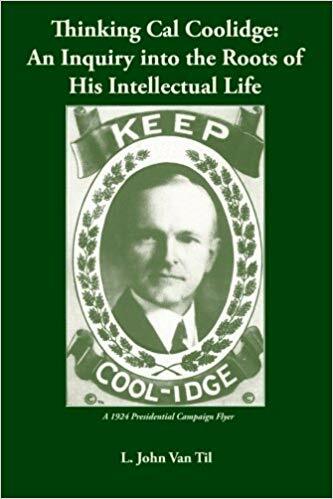 Coolidge, just as his name had secured nomination in his own right in 1924, lost his youngest son, Calvin Jr., to blood poisoning. History might have taken a drastically different course had either death not occurred. 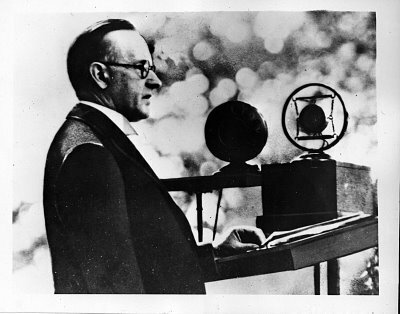 While Franklin D. Roosevelt’s Attorney General, Robert H. Jackson, himself a future Justice on the Supreme Court, conveyed an oft-held impression the dignified Mr. Hughes left with many people, when he said Hughes not only resembled Almighty God, he spoke like Him too. Or so goes the joke. President Coolidge had his own laugh on Secretary Hughes or rather on his distinctive facial hair, during one of the older man’s temporary stays in the White House. Coolidge dispatched the White House barber up to the Secretary’s room, instructing him exactly what to say. Sheepishly knocking on the door, the poor man dutifully repeated what the President told him to say and then listened for permission to enter. The President had sent him up to ask whether Secretary Hughes was ready for his scheduled shave. No answer could be heard from inside the room. The man went away without reply. Cal, learning what had happened as a result of his prank, smiled to himself. The President would send the poor barber up to Mr. Hughes door every morning of his stay in the White House with the same question. Having the utmost regard for his Secretary of State, it was still Calvin’s way of not only teasing the barber but also poking fun at the good-natured, yet professional, Mr. Hughes. Charles Evans Hughes (left) with friend and former Vice President under Theodore Roosevelt, Charles Fairbanks. Courtesy of metacolorblog.org. 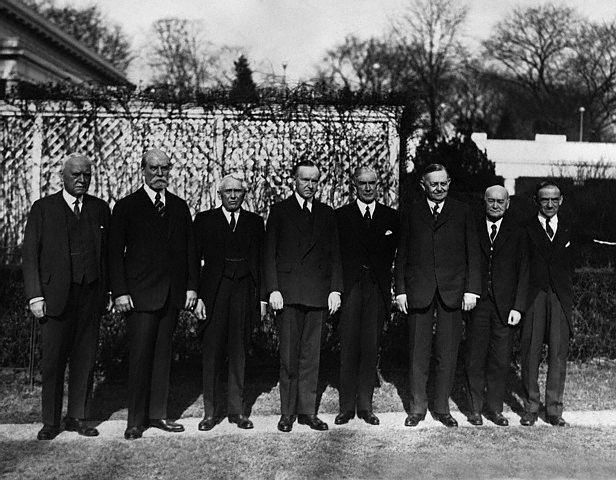 Members of the Pan American Conference to assemble in Havana, standing here on the grounds of the White House. L to R, they are: Judge Morgan J. O’Brien, New York; Charles Evans Hughes; Secretary of State Kellogg; President Coolidge; Henry P. Fletcher, American Ambassador to Italy; former Senator Oscar W. Underwood; Dr. James Scott Brown, Washington; and Dr. L. S. Rowe of the Pan American Union. 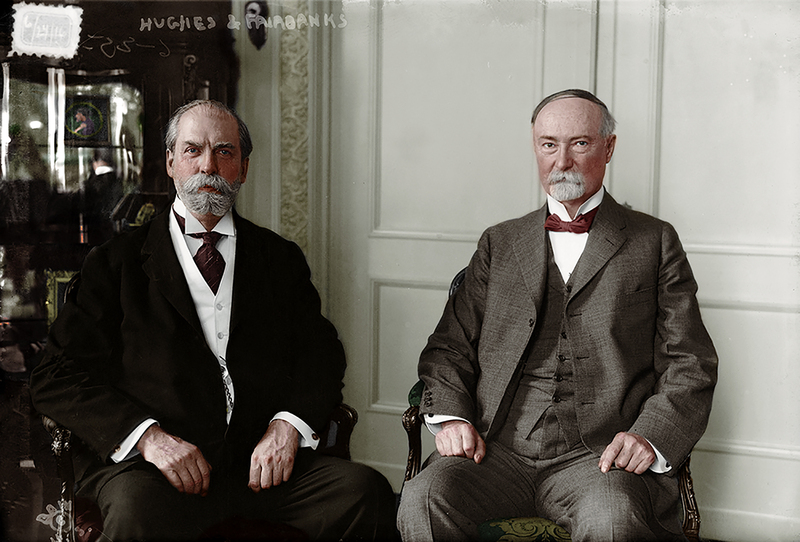 Not sure if you are aware, but the photo on this page of Charles Fairbanks and Charles Hughes is a black and white photo that I colorized. Thank you. I am aware and hope you don’t mind my use, credited to you and linked to your excellent site. My apologies, I just noticed your reply. Of course, I don’t mind your use of the photo. You have a well written and informative site. I have spent a great deal of time reading through the interesting articles. Thank you for providing the credit as well.